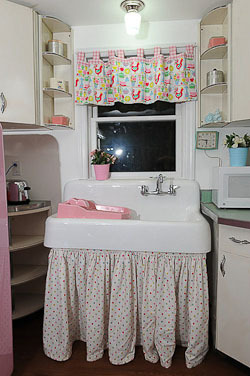 Reader Laura gets major snaps for finding the 42″ Sandford farmhouse kitchen sink, above, which she used in her adorable retro kitchen renovation. If you are doing a bungalow kitchen, or a Victorian kitchen, or a charming Farmhouse kitchen with any degree of retro / vintage twist — this sink would be great. You gotta LOVE the drainboard on the left — so useful. Other great details: It’s 42″ — a great size to pair with a 42″ vintage stove (repetition of sizes is good in design)…. It’s porcelain-enamel on cast iron — just like the originals… You’re going to use a wall-mount faucet, 8″ spread, like the ones here. Note, 7″ deep bowl is going to get splashy, a good excuse to wear a spiffy vintage apron. Where to buy: $827 with free shipping — Buy it exclusively at Signature Hardware, it’s made just for them, their website says. 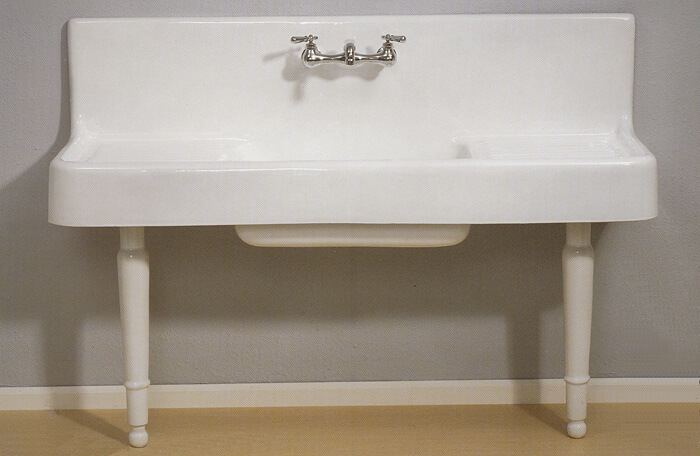 There is also a second, bigger choice for a classic, wall-hung, drainboard kitchen farmhouse sink: The Clarion sink, manufactured by Strom Plumbing. This design is a full 5′ wide, and because of its size and those legs, I would say that this goes in a Victorian kitchen or a vintage-retro kitchen that’s not trying to be “authentic” to any particular era. Bungalow? 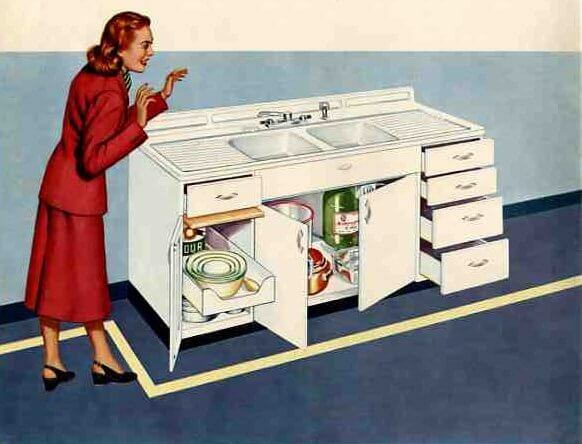 Maybe, but I think it would be pretty big for most bungalow kitchens – and I don’t *see* the legs in a bungalow, although the sink top design in general, yes. The Clarion includes two drainboards — one to the right, one to the left… a much higher backsplash… comes with two legs… and the sink is deeper, just over 9″. Like the Sandford, it also is “real deal” porcelain enamel over cast iron. It weighs almost 500 lbs, and is about $1550, with free shipping. — I get a spiff. Hey, every little bit for the blog helps. 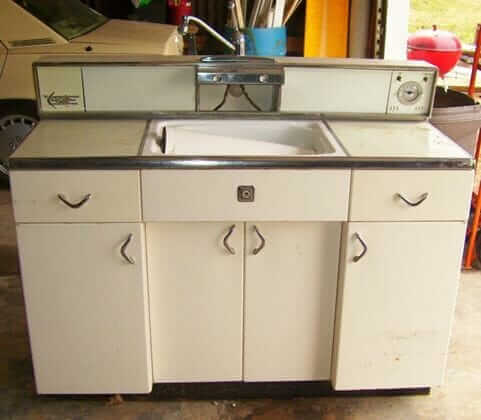 Do you want to see some vintage kitchen sink inspiration? 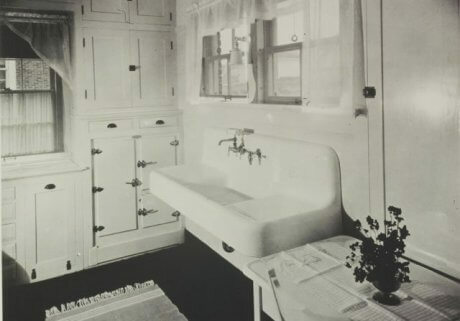 See this story with 16 photos of vintage Kohler kitchen sinks — awesome images provided direct to me from the great folks at Kohler. Were would I go to sell this? 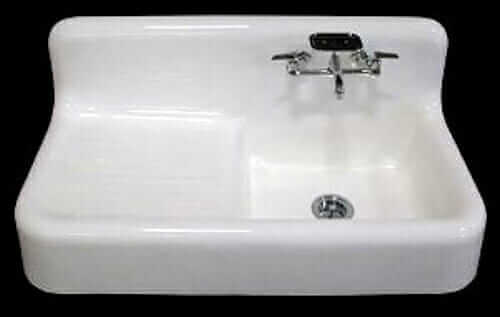 I am restoring an old two bowl farmhouse sink. The left bowl is deep and circular while the one on the right is square and more shallow. It almost seems like it might have been made to have some sort of insert? Anyone have any info on this style?